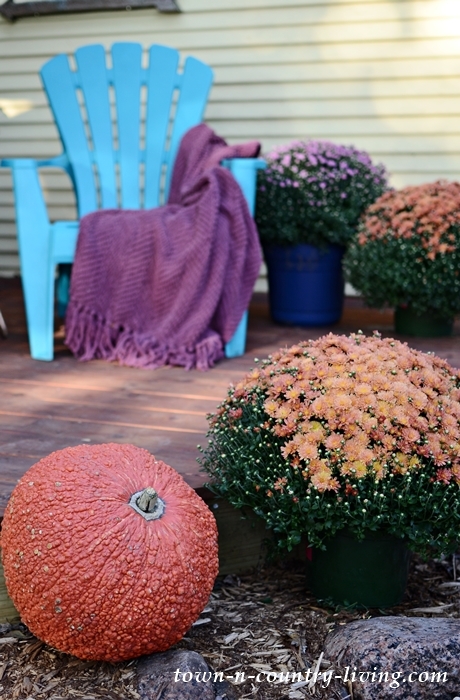 Easy Outdoor Fall Decorations: Think Mums! Although I hate to let go of summer, I do love the fall season with its crisp evenings and riotous color. 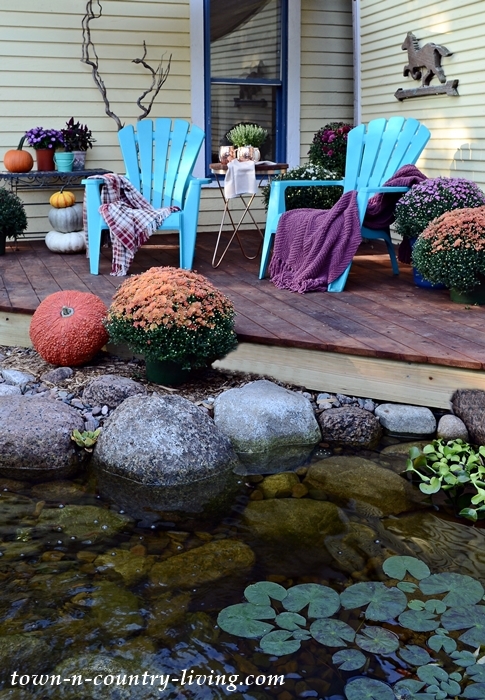 Today I’m sharing easy outdoor fall decorations to spruce up our new deck and pond! We just installed and stained our new deck a few weekends ago. I haven’t had time to consider furniture options so for now I’m using what we have on hand – along with plenty of mums! 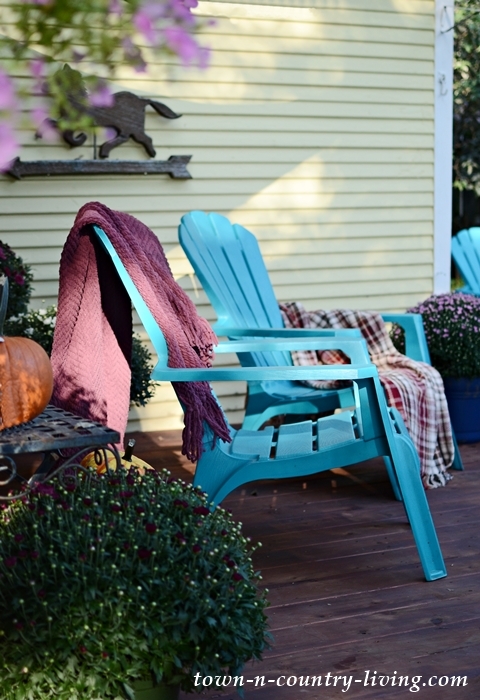 The Adirondack chairs match some of the trim color on our house. I carried my interior purple/wine/burgundy fall color scheme out here, as well. 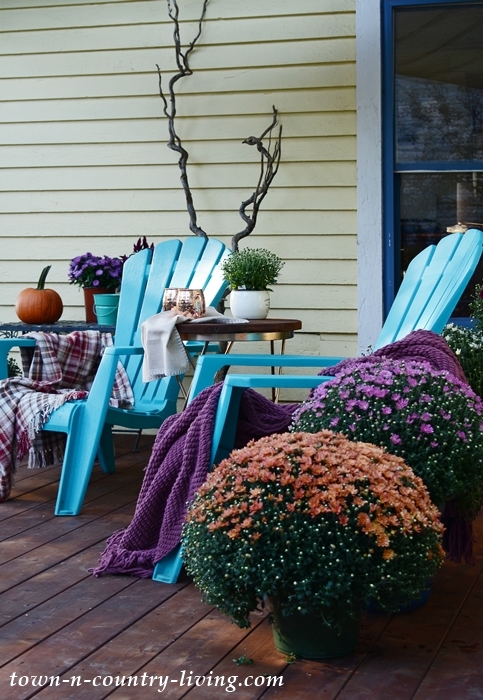 When it comes to thinking about easy outdoor fall decorations – think mums! Whether potted or planted in the ground, they create instant color. A few pumpkins here and there never hurts, especially with all the varieties available today. What I love most about our new deck and being outside this fall is our new pond! It’s just two months old and I can’t imagine life prior to having our own water garden. 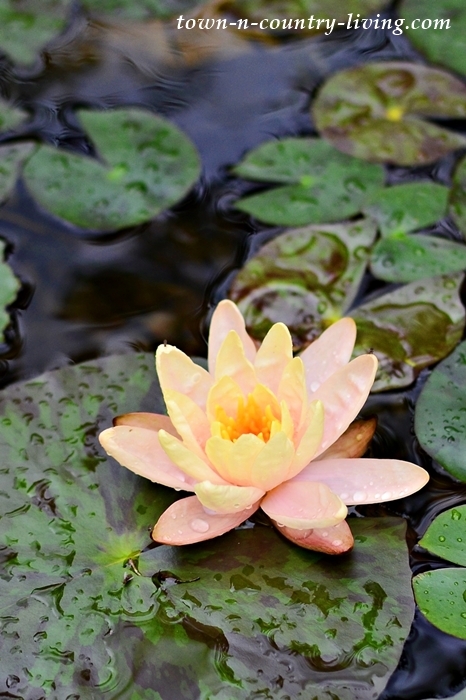 The water lilies were planted a few weeks after we got the pond. I wasn’t sure they’d bloom until next spring, but we did get one water lily! Watching the fish and feeding them is a great joy. The top two fish are golden orfes; they have a lot of personality. 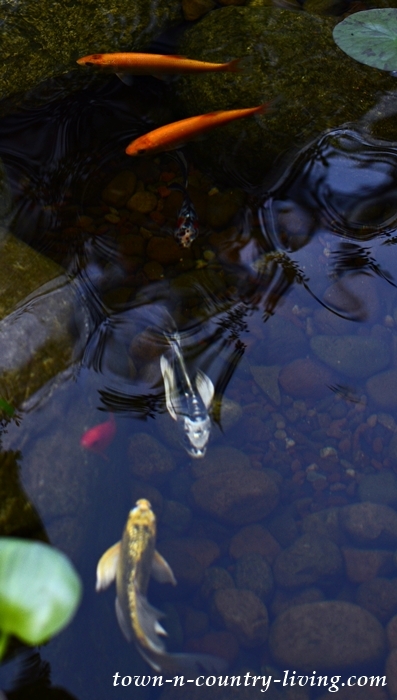 The white and black fish, and the golden fish are both butterfly koi. Look carefully and you’ll see the dark orange goldfish and the calico shubunkin. Not shown in the picture is our gray koi. Fall mornings are truly magical on the deck out by the pond. 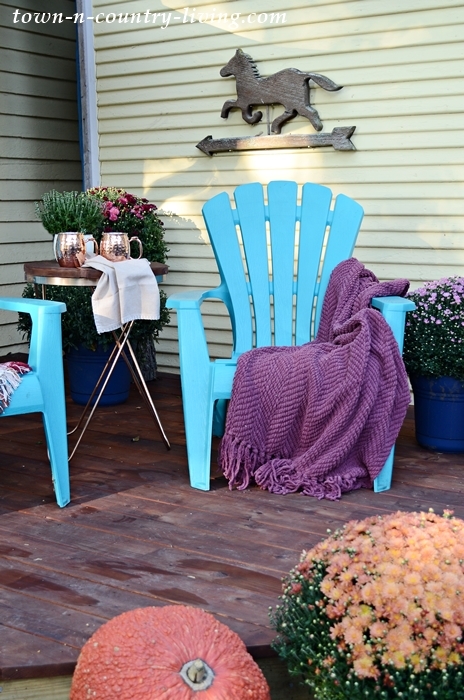 Colorful and cozy throws add to the fall outdoor decorations while providing a bit of warmth. Hubby and I love to sit out here and enjoy a Cup o’ Joe while watching the hummingbirds and butterflies that visit. 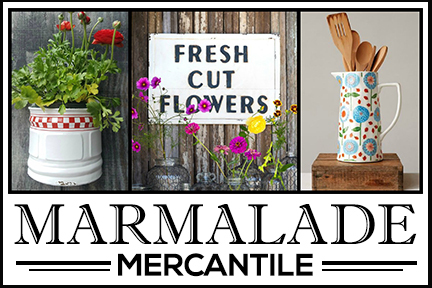 A warty pumpkin makes me smile – I like gourds that are a little different. And I found the wooden horse wall art for just one dollar at a tag sale many years ago. It’s one of my favorite bargain finds. 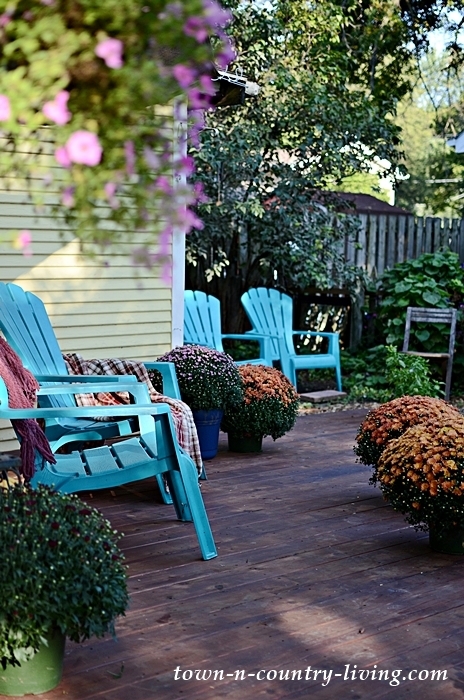 For me, the best outdoor fall decorations come in the form of flowers, primarily mums and asters. And of course – the view from the deck – our new pond! 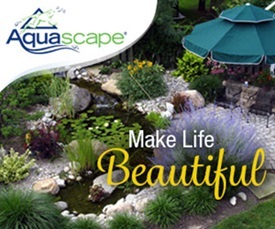 Stay tuned for more pictures of my Aquascape garden pond, fish, and water lilies later this week, along with my fall garden. 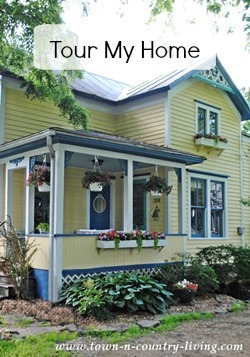 And be sure to visit my blogging friends below for more porch and outdoor decorating inspiration. Just gorgeous!!! Looks sooooo inviting !! 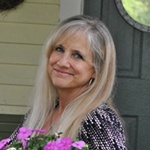 Thank you, Terri. We love it! 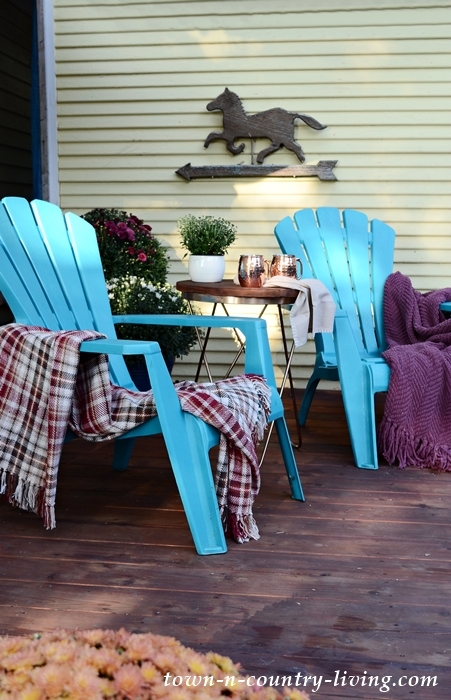 Your outdoor space is looking great. I love the pond but have a question about the fish. What happens to them in the winter? I know you’re not in a “warm” winter climate, so what happens to them when the pond freezes? Beautiful! I just love mums in the fall. They are the perfect addition. Thanks, Ashley. Mums are my favorite fall flower! Oh my gosh, so dreamy. That pond is gorgeous and I can just imagine how calming it would be to sit and sip your coffee and listen to the sound of water. Such a beautiful peaceful place to sit and relax, your mums and pumpkins add to it all. Happy Fall Jennifer. Thanks, Rhonda! We love the new pond. Thanks, Jennifer! We’re enjoying the pond as much as we can before the snow flies. What a lovely, cozy space to spend a fall evening! 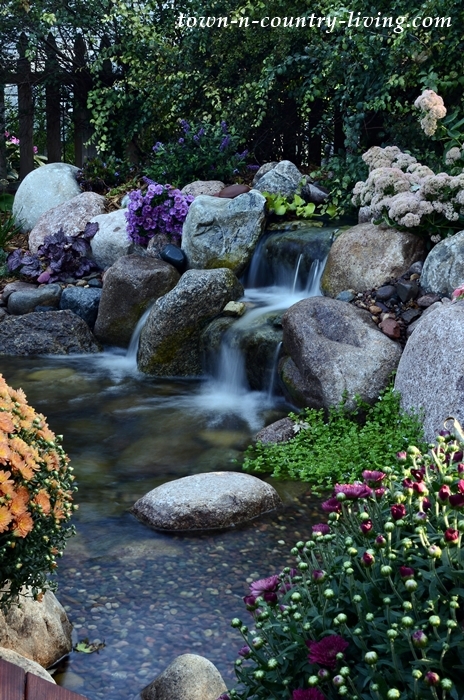 And your pond is stunning, Jennifer! Thanks, Krista! I’m enjoying your fall series! So beautifully done, Jennifer! That waterfall is the coolest! Hope you’re having a wonderful week! I love your pond and Deck! And, yes, I admit it, I’m genuinely jealous. In my neck of the woods, the mosquitos are absolutely horrid. How are they by you? 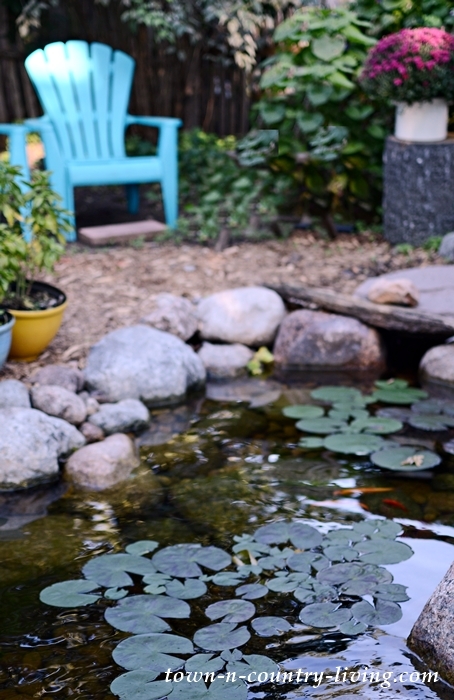 What a cozy and cheery deck…your pond is magical!